But this week’s extreme conditions have claimed a first cancellation. Friday’s RSNO concert at the Usher Hall, Edinburgh is off. It is hoped that Saturday’s repeat in Glasgow will still go ahead. UPDATE: Saturday’s Glasgow show is also cancelled. Actually, the SCO cancelled this evening’s concert in Edinburgh yesterday. A bit pedantic, Charles! I think we all know what he is – a doctor, whichever way you look at it, not a Mr or a Mrs, with a PhD, which is commonly known here in England as Permanent Head Damage!!! LOL! Someone with a PhD has a doctorate and is rightly called a doctor. Most medics who practise medicine don’t have doctorates and shouldn’t really called themselves doctors since they aren’t proper doctors. Actually, the BBC SSO also cancelled their Thursday night concert yesterday morning, so it’s the third cancellation, not the first. Much of Scotland has been under amber/red weather alerts since Wednesday morning, with constant advice from Police Scotland not to travel, so I think all three orchestras (BBC SSO, SCO and RSNO) are being very sensible. 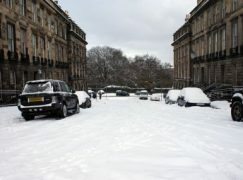 Opera North didn’t cancel last night, and you should have seen the snow here in West Yorkshire, and no trains after 6pm but they got the roads cleared and freed up the car parking. I travelled from Hull to Leeds on Thursday for the performance of Don Giovanni. The train ran perfectly to time (13:38 from Hull) – I stayed the night in the Travelodge directly behind The Grand Theatre. The streets and footpaths in Leeds were a bit slippery, but got up this morning and after breakfast walked to the station and took the 11:38 back to Hull, where there was lots of blue sky, and a definite thaw underway.